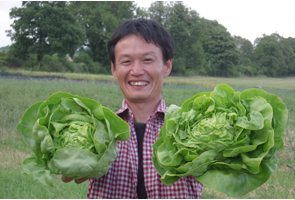 Shinya Imahashi was practising Shumei Natural Agriculture for 3 years before moving to England in 2005. Starting with a small allotment outside London, he moved to Harlow in Essex, and since 2010, he has been practising Natural Agriculture in Yatesbury. From 2014, the philosophy of Shumei Natural Agriculture has been shared with farmers in other countries in Europe. Shinya gives advice to farmers in Ireland, Spain , France, Greece, Italy and Germany.